How do you get kids to behave, calm down, clean up, transition, do homework, time out, stand and stretch? It’s all made easier with a soothing voice counting the numbers 1 – 20 over relaxing music with a soft beat. This “magic timer” counts numbers like a heartbeat. It is one beat per second, plus intro and fade-out; one minute of music in all. It’s a great behavior management tool to help kids calm their minds and focus on the task at hand. You can replay it for an extended countdown. 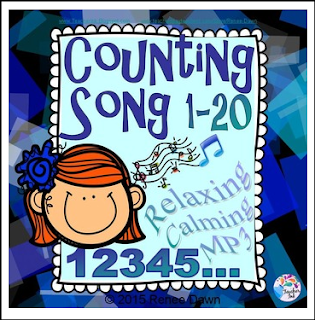 It’s also perfect for teaching kids to count numbers 1-20, as the pronunciation is slow, clear and correct. It’s FREE, so enjoy it...and if you would kindly leave your rating and feedback it would be greatly appreciated! For use by one teacher in the classroom. Please respect the copyright. You haven't LIVED till you've danced with a Chinese New Year Dragon! * NEW YEAR’S FUN! – Time Capsule Book of Resolutions, Mini-Books, Chinese New Year Dragon & Dance AND MORE! Number Chart Robots with 1 – 30 Charts: Beautiful Display Pieces! Number Chart Robots with 1 – 100 Charts: Fabulous Display Pieces! School Rally Song MP3—Personalized with your School’s Name!